What would sugar cookies be without sugar cookie frosting? That’s kind of like asking what a birthday would be like without any cake – it can be done without but it’s not nearly as fun – or tasty! This is a standard powdered sugar based frosting that spreads well and, when you feel like getting really fancy, works well with icing bags and tips. 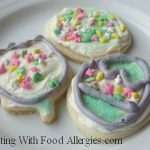 A recipe for frosting that works well for decorating sugar cookie cut outs. It is free of dairy, egg, soy, wheat/gluten, peanuts, and tree nuts. In large bowl, combine the sugar and shortening until creamy. Mix in milk and vanilla until combined well. If desired, divide frosting into bowls and add your choice of food coloring for decorating.